Director's cut: Earliest signal so far from the "big bang"
Earliest signal so far from the "big bang"
Today, the Harvard Center for Astrophysics had a press release (you can try to click the link, but this discovery broke the internet) from the BICEP2 collaboration, announcing the discovery of echoes from the earliest period in our entire history of the universe, effectively 10^-35 seconds after the cosmic inflationary event we colloquially call "the big bang". from the moments following inflation. To put this in context, this is one of the biggest discoveries in cosmology ever made. 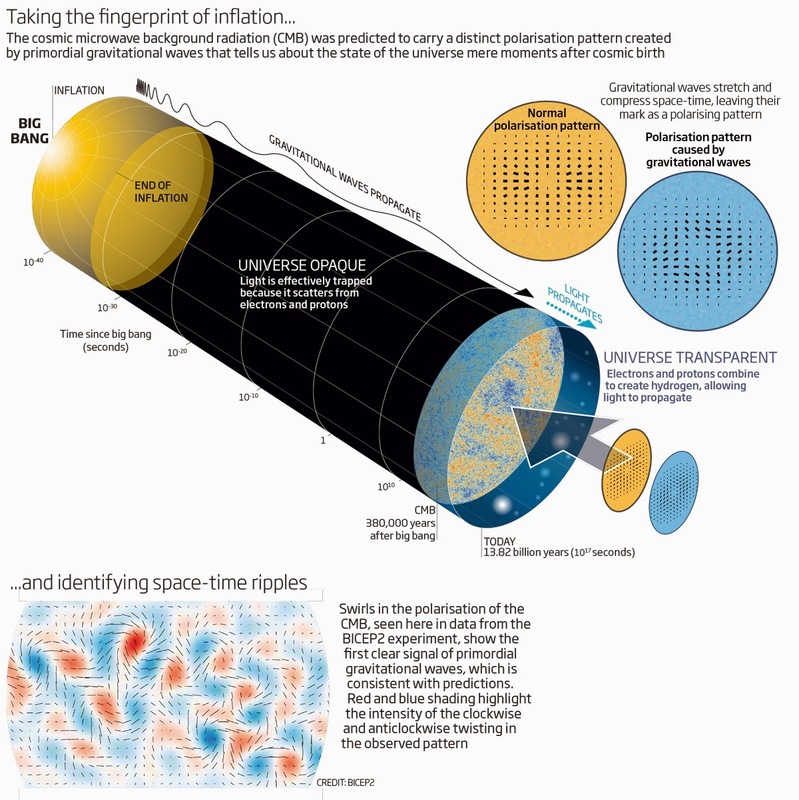 It provides the first direct evidence of the cosmic inflationary model ever observed. This direct evidence takes the form of gravity waves in a spectrum of photons that existed 380,000 years after the big bang. Gravity waves are little ripples in space-time that cause the force of gravity to shift slightly, as if it were water with a pebble dropped in it. However, unlike water, space-time can take on different distortions called "polarizations". Light exhibits this phenomenon that you are familiar with if you have ever used polarized sunglasses or lenses. The gravitational waves that were emitted at the instant following the cosmic inflationary event propagated through space-time, distorting it in multiple directions. The discovery by BICEP2 has observed these primordial gravitational waves, giving us the earliest known physical remnant of the moment of inflation ever observed. To understand how this observation was made, we must first explain the medium it was detected in. For the first 380,000 years following this event, the universe was completely opaque because light (photons) was being absorbed and reemitted instantly by the matter in the universe. As the universe cooled, the matter lost kinetic energy (exactly as your air conditioner functions). After 380,000 years, the universe had sufficiently expanded and cooled to allow light to propagate through the universe again. The interesting bit is that these same photons that existed 13.8 billion years ago are still around today. It is called the cosmic microwave background (or CMB). If you ever watched an old antenna television, a fraction of the noise that you observed was caused by these ancient photons in the CMB. The CMB is the medium via which the gravity waves propagated. By observing subtle twists and turns of the photons in the CMB, the astrophysicists at BICEP2 were able to discern a pattern that is compatible with the hypothesis of gravity waves being detected, but incompatible with the background. This signals a discovery of the gravity waves directly observable by us, here, 13.8 billion years later. In the analogy of the pebble dropped in the pond, we're literally jiggling around on the waves in space-time from the earliest period in the known universe. For a more technical discussion see Sean Carroll's blog post about it which is better than anything I have the expertise to explain. So gravitons are empirically confirmed? A year after the Higgs Boson? Who gets the Nobel for this one? Goood question, but there will almost certainly be one! Probably Linde, Steinhardt and Guth.